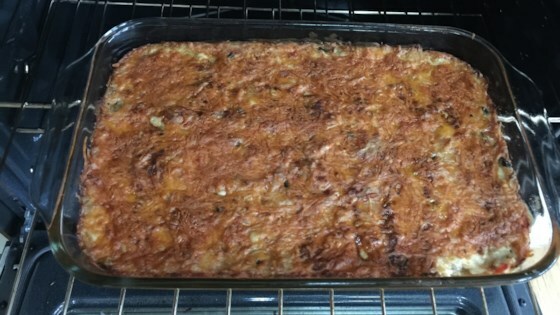 "I've tweaked my recipes for hash brown casserole until I came up with this very tasty dish. It's a family favorite!" Stir cream of celery soup, 1 1/2 cup Colby-Jack cheese, sour cream, Parmesan cheese, flour, and garlic salt together in a large bowl until smooth; add hash brown potatoes and mix to coat. Spread the potato mixture into a 13x9-inch dish. Sprinkle remaining Colby-Jack cheese over the potato mixture; dust with paprika. Bake in preheated oven until browning along the edges, about 1 hour and 15 minutes.